• Unlimited heated water. Unlike a traditional water tank system, a tankless system will never run out. If you find yourself periodically without hot water due to heavy use, a tankless system may be the easiest solution. Without a place to store heated water, there is no “using it up”. Rather, the tankless heater heats it as-needed. • Safer for the house. A water tank can crack over time and lead to extensive damage to the floor beneath it. Any contractor will tell you that the biggest danger to a house is water damage. It can create huge issues and require high-cost repairs. Usually a leak can go undetected until it has created a big problem. With tankless water systems, there is no tank to hold water, so leaks and their resulting damage are out of the picture. • Efficiency. Although tankless systems are usually more costly to purchase, in the long run they save hundreds of dollars. Think of the energy needed to heat a full tank, as opposed to the energy needed to heat only what is currently needed. There is where your savings come in. In addition, tankless systems are space efficient options. A hot water tank takes up space. Older models can take up considerable amounts of space but even newer models can be wasteful of square-footage. A tankless system doesn’t need that big tank space. It is a device mounted to a wall—no floor space needed. Plus the amount of space they take up on the wall is diminishing as technology creates even more efficient solutions. There are a lot of options when it comes to tankless hot water heaters. We decided to use our investigative expertise to come up with the absolute best options. Here is our list of the top three tankless water heaters available and one budget buy to round out our choices. Our number one product was the Takagi T-Klr2-in-NG Indoor tankless water heater. This one is a sleek and simply-designed heater. It comes in at number one because of its performance, its cost-to-value and its overall efficiencies. First of all, the Takagi is a 140,000 BTU unit and it has a maximum flow-rate of 6.6 gallons-per-minute. Its dimensions are 6.7-inches by 13.8-inches by 20.2-inches and it weighs 19.4 pounds. What we liked about this tankless water heater is that it has a great size for the heating efficiency it gives. 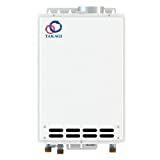 All tankless heaters are going to be space-saving as compared to traditional tank water heaters, however in the world of tankless heaters, the Takagi is still a stand-out. It has temperature monitoring on its intake and outlet, which means that it is able to deliver water at just the temperature you need. The wall space it takes up is efficient. On top of its size, it also is Energy Star rated, which means you can clearly read how much in savings you’ll cut back on annually. Next, we looked at the flow-rate. The Takagi has 6.6 gallons per minute of water. For some information on average flow rate, look at our handy charts below. In general, a good rule of thumb is that a home uses between 50-100-gallons of water a day per person. There’s a lot of leeway there because of the variation in appliance efficiency. A home with Energy Star-rated appliances is going to use less water than a home without. At 6.6-GPM, the Takagi will easily meet the hot water needs of a family. We also decided to assess the Takagi’s installation process. Luckily it comes with an extensive manual and complete instructions for installation. You do have to read them carefully, however this is standard to an intricate machine like a tankless water heater. One warning though- for the warranty to hold up, the Takagi must be installed by a certified professional. If you are comfortable with bigger jobs, you can likely handle the install but remember the warranty deal. A tankless water heater is important so if anything happens it may be better to let a professional install it so the warranty is in effect. This model requires outdoor venting due to its gas-feed. Venting can be done vertically or horizontally and the Takagi requires an electrical supply of 110-volts. Speaking of warranty, the Takagi has a warranty that covers the exchanger for 10-years and parts for 5-years. Though a professional is needed for installation, it is worth it. You want your water heater to work for years to come so having the added protection and backing of the manufacturer is important. The general cost-to-value on this heater is great. This is what truly earned its place as number one on our list. For the amount of money you pay, you want a big return in savings. Since this heater is Energy Star rated, it will provide a lot of potential savings—especially if you are switching from a regular tank water heater. You easily will see your monthly savings thanks to this unit. If you are upgrading your tankless unit to this one, you also should see some added savings due to its efficiency. The Takagi is our number one pick because we believe it offers the quality and performance reliability consumers want. If you are looking for a new heater, consider switching to this one. You will love how efficient it is and how well it performs time after time. Our second silver pick for best tankless water heater goes to the Ecosmart ECO 27 Electric tankless water heater. It earned this place due to its overall efficiency—both with energy use and space. We also loved its power and universal appeal to all areas of the U.S.. The Ecosmart ECO 27 Electric tankless water heater is a premier appliance because of its overall design. It is a 240-volt electric heater. Its dimensions are 17-inches by 17-inches by 3.5-inches and it weighs 16.8-pounds. We really liked the fact that it is a space-saver, not only as compared to traditional tank heaters, but also as compared to other tankless models. It requires three 40-amp double-pole breakers. This model is not only going to save space, but it also is going to save on energy costs. If you are switching from a traditional hot water heater, you are going to be amazed at the space you have and likely see cost savings almost immediately. When it comes to flow-rate, the ECO 27 is able to manage 6-gallons of water flow per minute. Like the Takagi that means it can sustain an entire household of water activity easily and efficiently. It also can handle a low-temperature range of incoming water. This is important because some locations in the U.S. are much colder than others. If you’re installing this unit in Minnesota, the winters are drastically different from the winters in say, Georgia for example. We loved the universal appeal of the ECO 27—it can handle inlet water that is just-above freezing as well as it handles moderate temperature water intake. It has a digital control panel that lets you set the temperature as precisely as by 1-degree. That means you can easily regulate the temperature to the exact heat you like. Installing the ECO 27 is a detailed and most likely requires a professional. Again- just like the Takagi, it must be installed by a certified professional for the warranty to be valid. Since it is an electric unit, it needs certain specifications to work but electric units are traditionally easier to install than gas units. There are specifics that need to be managed though. For example, this model demands 40-amp circuits and 8-gauge wiring. Though the install is intricate, the results are worth it. That’s why this heater still made it to our top three list. The warranty on the ECO 27 is one of the best because it is a lifetime warranty – of course, as long as it is installed by a certified professional. The warranty is on the exchanger and element, and the electronics. And it does not cover damages or labor. Still, covering the important parts of this tankless heater makes it worthwhile. Remember that your water heater is going to be with you for hopefully a long time so having added warranty protection is an advantage. The general cost-to-value ratio is high with this tankless heater. It’s made to be energy-efficient and since it is electric, you likely are going to see considerable savings—especially if you are converting from a gas tank heater. Savings are abundant with this model of heater and that definitely is going to be pleasing to any homeowner who invests in it. When looking at all of the advantages of the ECO 27, we were pleased with its overall performance. Not only is it energy- and space-efficient, but it is reliable and can handle heating colder-temperature water intake. It definitely earned its second place on our list of the best. Our bronze pick for best tankless water heater is the Rinnai RUC98iN Ultra Series Natural Gas tankless water heater. This is another standout in the world of gas-powered tankless heaters. This one made our list because of its sheer power and ability to handle a lot of water production. The RUC98iN is an Energy Star-rated heater that burns from 15,200-199,000 BTUs. It weighs 82-pounds and its dimensions are 10-inches by 18 ½-inches by 26-inches. Its voltage is 120. Don’t be fooled by its size—this is a powerful unit. It is built for both residential and commercial use. It can use either propane or natural gas and has numerous venting options. This unit has a lot of plusses. One is the control box. It allows you to regulate the heat as a normal box would, but it also lets you lock the panel. This is a handy feature if it is meant for commercial use or if you want to make sure it isn’t tampered with at home. Also- the different venting options make it versatile for anyone who wants to use it. The flow rate on the RUC9IiN runs from 0.26 all the way up to 9.8 gallons per minute. This means that it can handle multiple showers and faucets running concurrently. If you have a larger family or a heavy-water-usage commercial property, this may be the perfect appliance. It can produce water from 95- to 140-degrees Fahrenheit. Most likely any household that needs a new tankless water heater will love this one. We liked its overall appeal and power. The install for the RUC98iN is relatively easy. It has two venting options so that offers some flexibility to the consumer. It has both a concentric and twin-pipe PVC. Its inlet and outlet is made at a larger capacity than other units, which also makes it highly beneficial. Like the other models on our list, it has to be installed by a certified professional for the warranty to be valid. When it comes to the warranty, if installed by a professional it has a 12-year protection on the heat exchanger, 1-year coverage on labor and 5-year coverage on parts. For commercial use, it has 5-year coverage on the heat exchanger and parts, with a 1-year warranty on labor. There are some upgrades available to the warranty on labor if desired. Overall the RUC98iN is a reliable powerhouse of a tankless water heater. If you have larger water needs, this may be the perfect option. Its hot water production is one of the best we found and easily secured its place on our list as the third best heater available. When we review products we always come up with our top three, but also leave a spot for our honorable mention, or budget pick. For tankless water heaters this place goes to the Rheem RTE 13 Electric tankless water heater. It is a point-of-use heater so it’s best suited for small apartment use, or for single-occupancy residences. The RTE 13 is also compact and space-saving as a result. It is just 7.3-pounds and its dimensions are 7.2-inches by 7.2-inches by 7.2-inches. Yes it is small, but it is still able to produce a lot of heating power. This is another Energy Star rated machine. We paid special attention to machines that earned this rating because we are always most interested in appliances that save our readers energy costs. This one is a 13,000-watt machine that provides hot water at a good flow. It requires 240-volts and 54-amps. Yes- 54-amps is a lot, but that ensures that you won’t have any power issues or trip your breakers during use. Its gauge is clearly on the front of the appliance so you can easily set the water heat to the exact temperature you want. An LED display shows you if the machine is currently active or it is just on standby. When it comes to water flow, the RTE 13 can produce 4-gallons per minute. If you use the chart below, you can figure out your approximate household needs. Likely 4-gallons per minute is well above what the average household needs. We gave this water heating system a nod because of its space-saving design and combined ability for high-performance none-the-less. This heater uses a copper heat exchanger, which means it has a high rate of thermal conductivity—in terms of evenness and speed of water reaching the desired temperature. In terms of installation, the RTE 13, like our other models, is possible to self-install but it is recommended to use a certified professional due to the warranty. It is void if a professional doesn’t handle the install. It has a 10-year warranty on its heat exchange and a 1-year warranty on parts. Its cost-to-value is great. This machine is meant for a smaller household though so if you have a lot of water-users, you may need a bigger machine. Still, for one- to two-people households this may be a perfect option. The RTE 13 earned our budget pick slot because of its efficiency and ability to handle water needs of a small household. This is one of the most compact units we found and we were impressed by its output despite its smaller size. Its biggest plus is its size and for small households it is an efficient option for heating water. We scrutinized a lot of models to find the best ones. We looked at things like the specs including dimensions, weight and efficiency. We also assessed the water flow rate capabilities and the ease of install. We looked at each one’s warranty and the complete cost-to-value ratios. Our goal was to find the best ones available. Here are the details on what we looked at for each of our assessments. The first thing we looked at was the specs. We wanted appliances that truly were space-savers. If you are moving from a traditional heater, you are going to easily notice the difference. Not only does it free up space where your water heater was stationed, but it helps to provide precision regulation of water output temperature. The space-saving aspect is a huge plus. In particular if you have a small living space, having a tankless heating system is going to be a great benefit. You can easily turn the space you now have into a closet for additional storage. It will amaze you how the heating of your water is done efficiently by a small hanging unit instead of a large machine. We looked for tankless heaters that were small but still managed to maintain the power needed to be energy efficient. That’s exactly what we found with our four heating choices. They all take up small areas but are able to sustain a full household’s needs for heated water. We also looked for Energy Star-rated appliances, and they earned extra points if they were certified. Not only did we want the size to be efficient, but we wanted users to see energy savings also. For anyone who owns a house, savings are always desired. If you need power and efficiency, these four models are a great place to start your search. The next thing we looked at during our vetting of appliances was the water flow rate. We wanted machines that were not only able to keep up, but easily work beyond the needs of our readers. Our job is to provide options that are not just adequate, but standouts in the market. We wanted the tankless water heaters that produced a fantastic amount of water to sustain the average household. If the specific heater was more compatible with smaller households, we noted that so you can easily find one that works for you. If you need to estimate your water usage, use the above as a guideline. Remember though that water normally is used at specific times and not at the same rate consistently throughout the entire day. For example, if your family takes showers in the morning, this is a peak time for water usage. Or, if you do your laundry after you get home from work, this is another peak time for water use. To project your water use, it’s best to calculate the total amount of water used in a day based on the above listings and then divide that total to 2-hour period. So if you need 400-gallons of water a day, then you need a tankless hot water heater that can provide 33.3-gallons per hour to handle your peak daily usage of water. Our picks all can manage that amount and this is what put them at the top of our list. Admittedly these are general guidelines for calculating your household water needs, but it is a great place to start when looking for a broad approximation of how much output you need. We also looked at the ease of installation. Although all of our units need a certified professionals to install them for the warranties to be valid, we know that some of our readers are very knowledgeable with equipment. We have contractors, electricians and plumbers who loyally turn to us for suggestions. Because of this we know that some of them can handle installs—even more detailed ones like needed here. We wanted to gauge the amount of difficulty each install would require so consumers could decide if they have time to work through a full install, or if it’s wiser to hire someone to do it for them. Either way, the units we picked are relatively straightforward in design. Plus, the manufacturers went through added efforts to provide detailed manuals and instructions. With a working knowledge of machinery and how it works, it is possible to self-install our choices. On the other hand, if you don’t have the confidence or time to install on your own you can hire a professional to do it. Our choices likely won’t take them a long time to install (provided you have the right amperage and connections), so you won’t have to pay a lot for labor and time. We try to save our readers on all levels and the above four units can provide savings on installation time. We also scrutinized the warranties on all of our picks and these came out on top. We wanted warranties that covered numerous things: parts, and heat exchange. We know that both are vitally important to the overall lifespan of the machine so they were a priority when looking for coverage. Our four chosen models all offered good protection. Yes- for that protection to be in effect a certified professional must do the install, but this is understandable due to the complexity of the appliances. In addition, we wanted the manufacturers we chose to offer the support customer’s needed both short-term and long-term. Your hot water heater is going to be with you for years to come, so we wanted to be sure that their manufacturer stood confidently behind each product. It only benefits our readers more to have a partner in the lifespan of their chosen appliances and we are all for accenting benefits. That’s the reason why we take such care in reviewing our products and only champion the best of the best. Finally, we looked at the cost-to-value ratio. Yes some of our choices cost a little more but deservedly so with their power and ability. We aren’t afraid to stand behind products that cost more as long as they can prove to us that they deserve it. Does the product offer a fantastic product? Does the product save the consumer money? Does it save the consumer energy? Does it offer great long-term support? Does it seem durable and long-lasting? These are all questions that play into the cost-to-value ratio and how high it is. We ask these questions every time we do an assessment of products to compile our list of the best. We want to promote products that we would want in our homes. Products that truly create value and make households better as a result. That’s exactly what we found with the above three top-picks and our budget pick. We are happy and satisfied with the final lineup. In the end a tankless how water heater can be one of the best ways to save on money and energy. Just think of how much water you use daily and you can guess how much an efficient heater can do for you. If you are in the market for a new heater, consider the ones we chose. We vetted them thoroughly and we’re confident that they will serve you well for years to come.